Marketing. This is the lifeblood to any successful financial advisory practice. 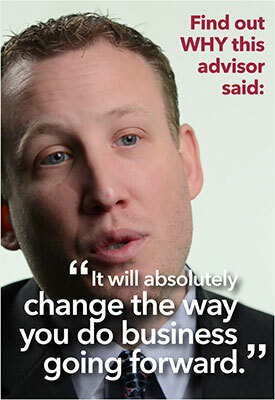 Our job is defined very simply... make the lives of our advisors easier, so they can do what they do best. We've built our financial services marketing programs with you in mind, and our commitment to you is to relentlessly pursue and create the most innovative marketing initiatives for you to seamlessly integrate into your practice... and we are committed to doing so with a focus on compliance. This territory protected, turn-key seminar system has revolutionized financial seminar marketing. Our Audio Visitor Corporate Interview CD is the equivalent of a talking business card. Personalized and customized to you, this library will differentiate you from the firm down the street. AdvisorGEEK® website packages allow you to quickly and easily get a presence live on the internet. We have a strategic partnership with one of the industry's leading financial marketing providers. This powerful client newsletter lends instant credibility to your client seminars, speaking engagements and more! A library of consumer reports and whitepapers for you to customize and integrate within your practice. The corporate brochure and/or referral card is customized with your firm's colors, logos, and unique message. We customize a corporate introduction video to your practice, giving you the chance to tell who you are. A simple, 13-step process that will transform your clients into partners. We've created a sophisticated lead generation engine that harnesses the horsepower of internet searches. Keep your clients in the know every month on trends developing in the economy and markets.